9.5 ACRES of PRIVATE, SECLUDED , rugged land situated in the Santa Ana Mountains for a weekend get-away retreat. No utilities available. Located in the Cleveland National Forest this property is accessed by maintained dirt roads through locked gates. From the Corona area gate it is approximately a 20 minute drive up a steep mountain dirt road for 5 miles. From the Blackstar Trail Gate on the Orange County side, it is roughly 8.5 miles up a dirt road. Incredible panoramic views of the mountains and ocean. Hike to Beeks Place, Doppler Tower, Pleasants Peak, Bedford Peak, Santiago Peak, Blackstar Indian Village site, Holy Jim Falls, Maple Springs, Hagador Canyon, etc. At approximately 2600 ft elevation, Catalina Island, Long Beach, Fashion Island, Disneyland Fireworks, San Pedro, and Rancho Palos Verdes Peninsula are all enjoyed from this beautiful property. Wildlife in the area include mountain lion, mule deer, bobcat, coyote, gray fox, skunk, squirrel, spotted owl, ring-tailed cat, american badger, golden eagle, mountain quail, canyon wren, etc. 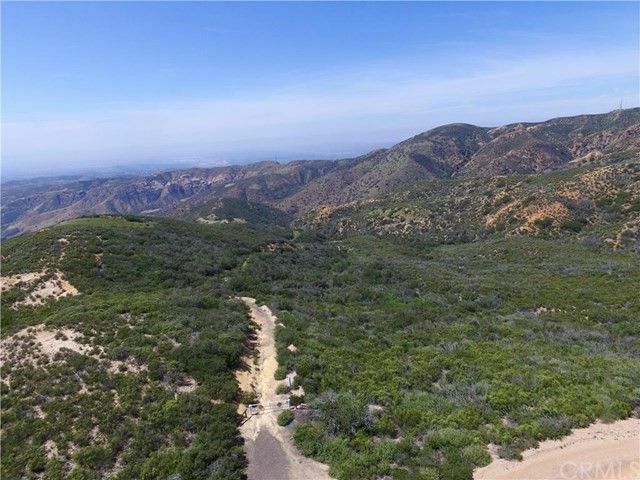 Property is rugged and covered with thick, native brush, including Manzanita, Toyon, Chaparral, Yucca, Scrub Oak, Holly-berry, Lupin, California Poppy, California Fuchsia, Coastal sage scrub and more. You can own this amazing property for your FAMILY RETREAT! Great portfolio investment! !